(Charlottetown, P.E.I.) — Anishnaabe artist, Robert Houle, a member of the Sandy Bay First Nation, near Winnipeg, Manitoba, recently attended the opening of the Confederation Centre Art Gallery’s major permanent collection exhibition, RE:collection, and made introductory remarks and presented a public art talk on his 2017 painting, O-ween du muh waun (We were Told). Commissioned by the Confederation Centre Art Gallery (CCAG) to mark the 150th anniversary of Canadian Confederation, with funds from the A.G. and Eliza Jane Ramsden Endowment Fund, Houle’s oil on canvas triptych is a very timely consideration of the long First Nation’s presence in this land and more generally the idea of history painting. Houle’s work is a major addition to the Gallery’s collection and specifically the Confederation Murals Series, which includes works by Jean Paul Lemieux, John Fox, and Jack Shadbolt, commissioned in 1964, and work by Jane Ash Poitras, Yvon Gallant, and Wanda Koop commissioned in the 1990s. Houle’s new painting is a further elaboration on his 1992 work, Kanata (collection of the National Gallery of Canada), in which he appropriates and reimagines the composition of Benjamin West’s 1770 painting, The Death of General Wolfe. West’s painting famously mythologized the battlefield death of the British general who led his troops to victory in the 1759 Battle of Quebec. Houle drew all the figures in West’s composition in conté, reserving colour for only the Indigenous figure in the foreground. 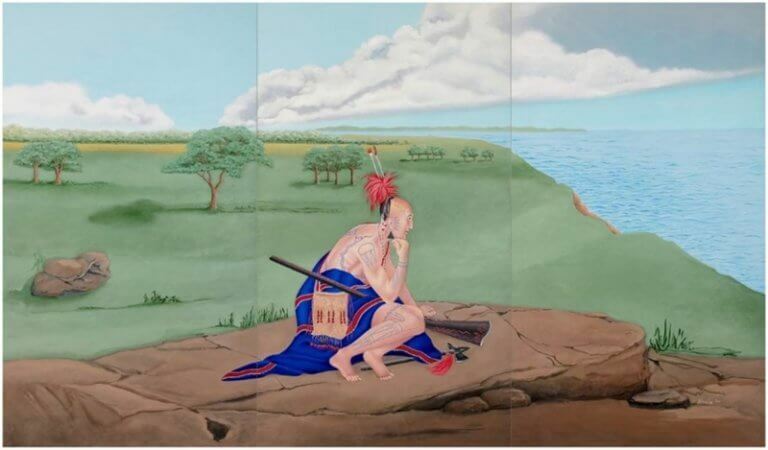 In his new work, O-ween du muh waun (We were Told) Houle focuses exclusively on this same Delaware warrior figure, seated on the Plains of Abraham, and facing east. He eliminates all the other figures from West’s composition. Like much of Houle’s work, O-ween du muh waun (We were Told) addresses current political and cultural issues by looking to history. As Canada looks towards a reconciliation with First Nations, Houle’s painting stands as an important marker within the CCAG’s collection and the RE:collection exhibition as it explores the building of a Canadian art collection as an optimistic mission and a reflection on the evolving country, its history, geography, people and communities. Houle was born in St. Boniface, Manitoba, in 1947 and currently resides in Toronto. He is widely acclaimed for bridging Indigenous history and contemporary art. In 2015 he received the Governor General’s Award in Visual and Media Art for his significant contributions to Canadian art. O-ween du muh waun (We Were Told) is on display in Upper West Gallery at the CCAG until December 31. Image Cutline: Robert Houle (b.1947), O-ween du muh waun (We were Told), 2017, oil on canvas triptych, 213.4 x 365.8 cm, commissioned with the A.G. and Eliza Jane Ramsden Endowment Fund, 2017, CAG 2017.1.